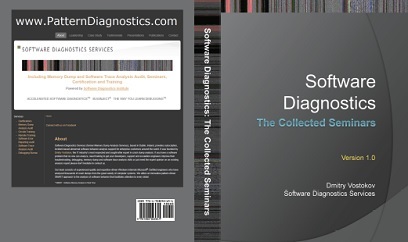 Also available for sale in PDF format from Software Diagnostics Services. This is a collection of Software Diagnostics Services webinar transcripts about pattern-oriented software diagnostics developed by Software Diagnostics Institute. Includes 9 seminars on pattern-driven software problem solving, software narratology, pattern-driven software diagnostics, systemic software diagnostics, pattern-based software diagnostics, philosophy of software diagnostics, victimware, malware narratives and pattern-oriented network trace analysis.